This year, I’ve written way fewer preview/speculative pieces because of the fact that there are actually a lot of “Essen Games” actually available! And, rather than write about stuff I don’t know much about, it seemed better this year to write reviews or first impression pieces of games I’ve actually played… But – some habits die hard, so here I am writing about things that I want to check out when in Essen! First up is a set of games that threatens to create a new genre – the Scratch-Off game! Thus far, I don’t have much information on Scratch Wars and Planet Surprise (both from Notre Game) – but what I know has my super-intrigued. Essentially, both are based on the idea of a scratch off card, you know, like the instant lottery tickets that you surreptitiously buy when you’re at the gas station. Planet Surprise appears to be a discovery game. Each player gets a single card for the game – everyone gets the same card – I suppose this is determined by the artwork. 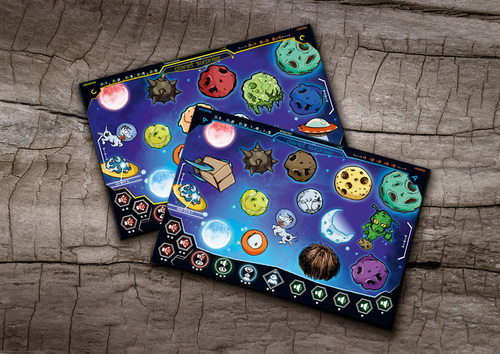 Throughout the course of the game, players will scratch off planets to reveal points underneath. There are six different actions that players can use to figure out where they want to scratch. The actions themselves are also scratched off the card so that you always know what you have available to you. The game seems like a supremely portable activity, and I think it would help us while away the time at the inevitable soccer rain delay. What remains to be seen is how the game is packaged/sold. As each game needs to be played on the same card – I would guess that they come in sets, one for each player. If you play with less than the max number, I’m not sure what, if anything, you do with the leftover cards. The other thing that I find interesting is that the game can even be played solo – there is a phone app that you can scan the card into and then duel online. The combination of the physical cards with the possibility of online play is definitely intriguing. Based on the pictures found online, it looks like this is sold as a base set in a tin and then booster packs (that look similar to CCG packs). It will be interesting to see how the idea on one-use scratch off cards works in a game. Definitely on my need-to-check out list! Another theme that seems to be unique to this year is the proliferation of games about Martin Luther and the Protestant Reformation. This year is the 500th anniversary of his Theses being nailed to the door of a church in protest of the Catholic practice of selling indulgences. (See, my Catholic education has finally paid off!). As Luther is a German, born in Eisleben, they are certainly interested in celebrating the anniversary of such an important event. Thus far, I have found four games that use this as the central theme – and confusingly, two of them use the same portrait (by Lucas Cranach the Younger) as the cover art! Martin Luther: Das Quiz (Huch!) is the one I’ll likely not look at. It’s a trivia game, and it is almost certainly in German. That’ll be hard for me to read. Mea Culpa (Zoch) seems to be a more lighthearted take on the whole Indulgence idea. While Luther isn’t specifically mentioned, I can only imagine that a game about indulgences was timed for this year due to the anniversary. Here, players are sinners, and they move around the board (sinning) and then trying to atone for those sins by getting letters of Indulgence and by contributing to the construction of the local cathedrals – thus proving their piety through their bankroll. I’ve read through the rules to this one, and it looks interesting enough to try. There is usually a press event at the start of the show, and I hope to get in a test game of this early into SPIEL. More news to come on this hopefully on the Wednesday of the show. Sola Fide (Spielworxx) is the final entry thus far in the burgeoning Luther genre – it’s done by the team of Jason Matthews and Christian Leonhard, and as you might expect it’s a 2-player asymmetric game, in line with Founding Fathers, Twilight Struggle, and other games done in part or in whole by the two designers. I’m really not a big fan of the format – mostly because my gaming time doesn’t set up well for 2p gaming- but given the designers and the publisher, it’ll get a look-see at the show. The idea here is that one player is trying to spread the Reformation while the other player plays as the Catholic Church trying to squash the heretics. I’m honestly not sure if I’m overly interested in religious themed games, but as I won’t be around for SPIEL 2117 or 2517, I might as well take a look and see what is to be had on this important round-number anniversary. 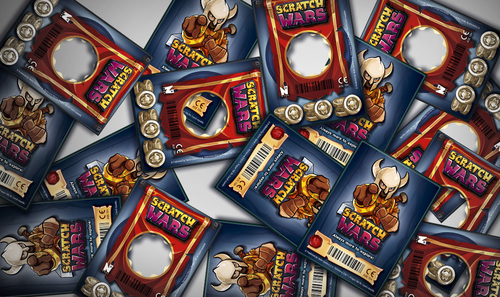 Scratch-off games are not a new idea – they have been tried a couple of times before, including (I think) by Games Workshop. Maybe they’ll catch on this time. Sola Fide is a redesign of Jason and Christian’s earlier game, Campaign Manager 2008. I believe it is mechanically similar, but the events are obviously different and I think they also may have made it more assymetric than the earlier design.